Pictures: Eric Guilhe, Passion/Speed/Skating and the McAnuff personal collection. I still recall the first few times I saw the McAnuff brothers on the ice. They were not built like most skaters. Strong upper body, wide shoulders, they looked like elite swimmers more than short track speed skaters. Smaller skaters seemed to be impressed, probably thinking the track was already small enough and occasions to pass so rare, how would they deal now with skaters that big? One thing was sure: classic skater shape or not, Ryan and Sean McAnuff were definitely strong. If everyone in the stands at the time saw their potential, nobody could have predicted that they would have ended up skating on the World Cup circuit just a few years later. While I was in Sherbrooke for the Quebec Open Championships, I sat with Sean and Ryan to talk about their last couple of years and at the same time learn more about them and how short track speed skating came into their lives. When it was time to choose a college, they chose to enter Bishop’s University in Sherbrooke, Quebec to study biology and joined the CPVS (Sherbrooke Speed Skating Club). 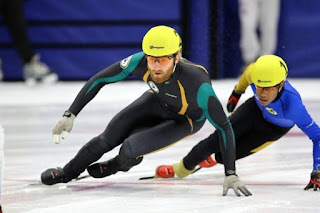 While Sean and Ryan’s passion for short track speed skating is evident, the deep pool of talent in Canada, combined with their age and where they were at in their development, made it seem like the window to eventually join Team Canada was shutting down slowly. It kind of came naturally to seek other opportunities. (R.M.) “We’ve had our irish citizenship from our dad since we were kids and we hadn’t think about skating for Ireland at that point. Our dad was in contact with the ice skating president of Ireland. They had ISU memberships for figure skating but they didn’t know much about speed skating. We enquired about the possibility to help build it up because there were no speed skater in Ireland at all. In Christmas 2014, the whole family flew to Ireland and we brought a bunch of skates, suits, helmets, gloves, neck guards and did a mini camp.” Like the classic quote in the american movie classic Field of Dreams: “If you build it, they will come” the McAnnuff brought speed skating to Ireland and about a dozen enthusiasts came. Some had no skating experience at all, others came from figure skating. They did a second camp two years later, again in Dublin, on an outside rink this time. Easy to say, they pretty much gave birth to speed skating in Ireland. But what could be more helpful to promote this than being able to represent Ireland on the world stage? Getting there is an amazing story but how was it the first time they got on the starting line of a World Cup event? 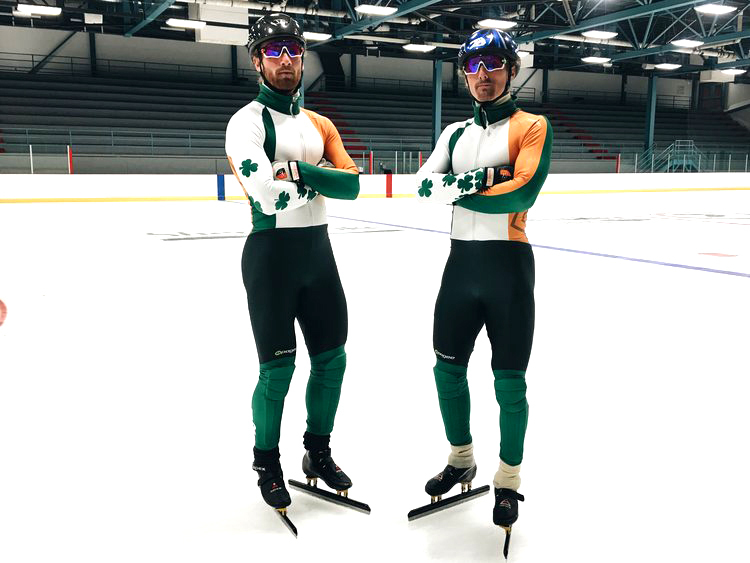 Outside of the thrilling on-ice competing experience, the two brothers also enjoyed being part of the international short track scene for many other reasons. It gave them the opportunity to travel and meet people from all over the world who share the same passion. They also had the chance to get on the ice with different countries during practice on the week before the different events. Ryan even had the opportunity to train with Team Russia once and after the first few minutes of wondering if anybody on the ice would speak english, he had a great time with the russian skaters and coaches. Most people they have met this season were excited for them and happy that they were promoting speed skating to a new country. Next season will definitely be a bit different for the McAnuff. Even though the passion and desire to do even better will still be there, 2018 is an Olympic year and the idea that one of them or even both could take part in the Olympic Games is quite daunting. The task ahead to turn that dream into reality is big, but it’s not impossible. They’ll need to finish in the top thirty-two in one distance in three of the four World Cup events this fall. Last season in Calgary. Sean finished 40th on 1000m and 38th on 500m while Ryan finished 34th on both the 1500m and the second 500m of the event. 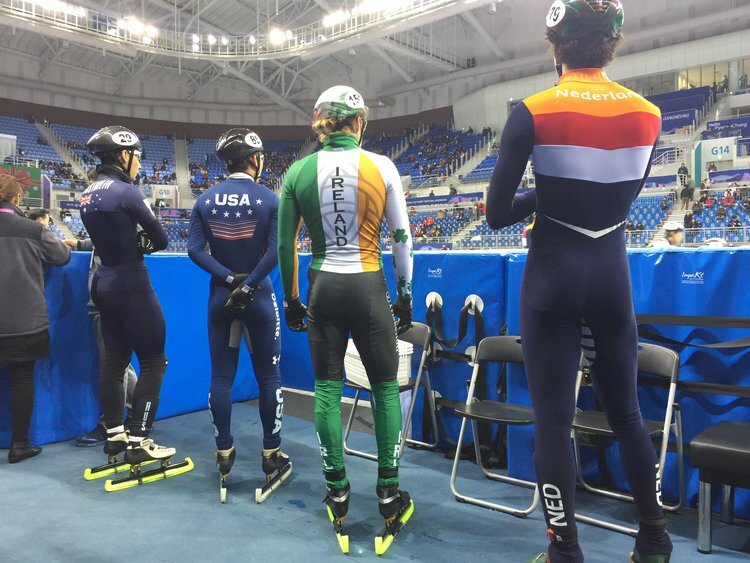 In Gangneung, Sean finished in 42nd and 41st place respectively on 1500m and the 1000m number two while Ryan was penalised on the 1000m but did finish 31st on 500m. As for school next year, Ryan just completed his degree and Sean will take a year off to be able to concentrate on the opportunity ahead. We all agreed that being able to represent Ireland in the Olympic Games would be an amazing push for their project of developing the sport there. There was plan for an arena in Dublin, but the project was put on hold. Showing their green, white and orange skin suit with clover leaves on the right sleeves at the Olympics would mean a lot and could probably help relaunch this project. There is a reason why Sean and Ryan didn’t strike me at first as having classic speed skater physiques. If the old saying “Everyday is leg day” is true for all skaters, for the McAnuff everyday is full body day. 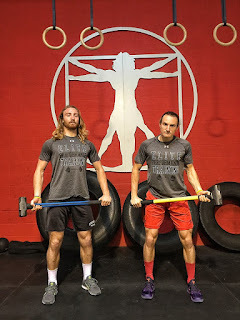 They have been passionate about weight training and body weight training for a while and started sharing training videos on Instagram ( @elite_performance_training ) in 2015. 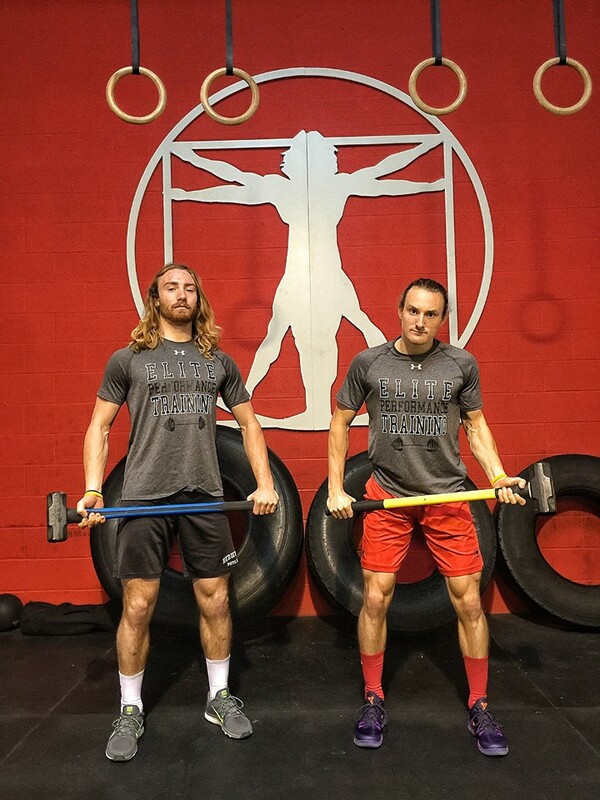 Last year, they launched their own website and are now offering custom workout programs. They are both certified personal trainers. This new endeavour just started, but the idea of it eventually becoming their career is a possibility. Plus, this project could eventually help them funds their speed skating adventures. Keep an eye on Sean and Ryan McAnuff. 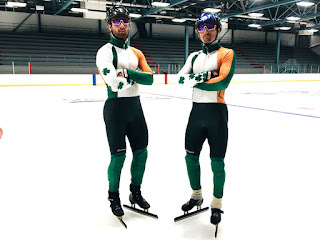 If hard work always pays off, the fighting irish of speed skating aren’t done surprising us on and off the ice. Sean and Ryan are presently in Salt Lake City to prepare for the upcoming season. I wish them continued success. Thanks for the interesting story.